Today’s inspiration shoot was put together with a fabulous team. 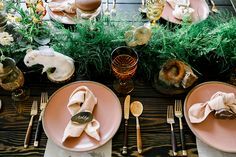 We collaborated with Nick and Aleah of Valley & Co. to design a clean, modern tablescape that is fresh and fun with just a bit of whimsy. 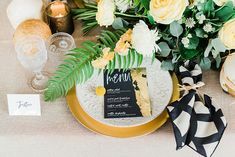 Erika of Delphine Press designed a stationery suite to compliment the design with bright accents that, along with yellow and turquoise plates, give each setting a pop of color. Grand Floral provided sophisticated floral arrangements with simple white roses and white china mums in milk glass vessels. 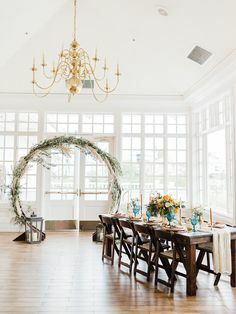 When put together with white-washed chiavari chairs and a white linen, the end result is a sleek table design perfect for an outdoor affair. Special thanks to Kristen Peelle for capturing all of the details. We hope you’re inspired! 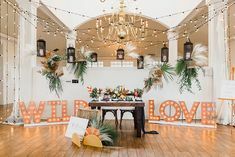 VENDORS: Photography: Kristen Peelle, Table design: Valley & Co. and The Bride Suite/Exquisite Weddings Magazine, Linen: A Perfect Table, Floral: Grand Floral, Stationery: Delphine Press, Chairs: Concepts Event Design, Dinnerware: Crate & Barrel. To see more from the shoot, visit Valley & Co.’s blog. Lovely post! We had fun putting this together – we love the clean, spring-inspired result! absolutely love that color combo. LOVE IT!